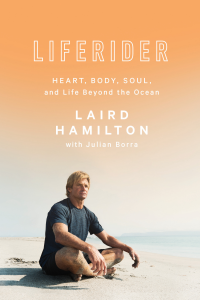 Laird Hamilton is a – if not the – veteran big-wave surfer and fitness expert who’s got a new clothing line called Laird Apparel, arriving later this month on October 22. The line is a three-part series of technically-crafted performance based wear: Off Shore, Fitness, and Lifestyle. Hamilton hopped on the phone to talk to For The Win about the clothing line, foil boarding, and what it’s really like to ride a massive wave. MP: So, I watched the WON DAY promo video, and I have to ask – is that what a regular day for you looks like? Right down to using a machete to drink coconut water? LH: [laughs] Well, that was the toned down version. Yeah, one of my main objectives is to do three-to-four disciplines everyday. LH: Yeah, disciplines like wind-surfing, stand-up paddling, that sort of thing – every activity being a discipline. MP: I see. Where does foil boarding fit into that? Matter of fact, how did you come up with the idea to surf waves with a foil board in the first place? LH: Hybrid – or rather, foiling devices for riding behind boats, we got our hands on one of those and then came to the realization that we could use it to ride waves. 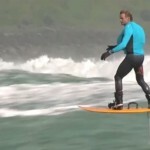 And not only could we use it for surfing, we could use it for kiting too. Wave foiling for me is the pinnacle of my wave-riding evolution, really. We’ve been doing it for 15 years or more. We got the foil board when I was with the Oracle Team for America’s Cup and just went from there. MP: What’s the correct term for it? I called it “hover-surfing” because it felt right, but what’s it actually called? 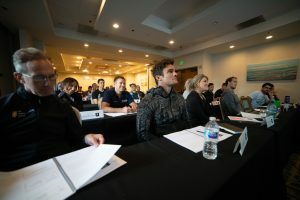 LH: [laughs] We call it “fun.” [laughs] But I mean, call it what you want: foiling, foil-surfing, kite-foiling..
MP: Can you describe surfing for someone who’s only successfully stood up on a surfboard once before painfully catching his edge? LH: Oh my gosh. That’s almost as difficult as explaining what a color looks like. It’s one of the top experiences you can have as a human on Earth. Sure there’s wingsuits and other risky stuff like that, but the elusiveness of giant waves lend to the experience being so unique. Sure you can go out and look at them and they’re beautiful in their own right, but it takes perseverance and years of experience to go out and actually take advantage of that opportunity. There’s also the mindset it puts you in. It’s that same instinct that makes you run from giant animals to survive. 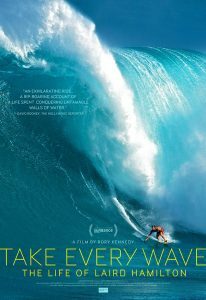 You have a primal, survival instinct, and a big wave will bring it out. 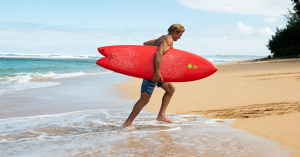 MP: Is it that same survival instinct that led you to use your trunks as a tourniquet when you were saving your friend in the surf? LH: Well yeah. But it was my wetsuit that I used as a tourniquet [laughs]. MP: While we’re substantiating rumors, there’s no footage anywhere, so is it true that you jumped off of a 60-foot cliff into deep water at the age of seven? LH: Oh yeah well that’s a story that my dad tells and you know how that is, the details change a lot. I’m pretty sure it was a 60-foot cliff, but I might’ve been eight years old. But I never really had that fear of heights and was always jumping off of stuff, even at a young age. It’s just kinda something you’re born with. I’ve been doing it my whole life. MP: So we’ve been talking surfing, but you’ve got a clothing line coming out. LH: Yeah there’s a pop-up at Ron Robinson in Santa Monica later this month. It’s – I like to call it a soft opening. We’re developing the online aspect, and we’ve just begun to get guys i’m connected to using the products and giving a little feedback. It’s a young business, and you know, you have to walk before you run. You have to ride the one-footer to get to the two-footer and the two-footer to get to the three-footer. You can’t just go straight to the 80-footer. MP: How’d you decide to get into making clothes? Was it just about replacing everything in your closet with your own stuff, or is there more to it than that? LH: Well from what I’ve seen from all of these big surfing apparel lines that capitalize off of surfers, but the surfers didn’t really make anything off of it. I’ve been sponsored for more than 30 years. And at some point you just think: why not become your own sponsor and not be sponsored? And anything worth doing is worth doing right. Make it authentic, or you lose the heart of it. Make sure it has great quality and design, and the rest will take care of itself.